It's easy to overlook details when your focus is on the big picture. But, if you adjust your perspective, you may find new value in understanding why things work the way they do. 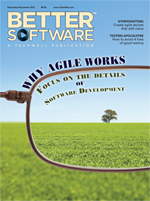 Learn why agile works and how it can apply to both complex and simple projects. Software test automation has been around for a while, but it faces some specific challenges in an agile environment. Here are seven practices that will help you get the most out of your test automation within agile's short development cycles. The demand for software engineers is outpacing the supply from colleges and technical schools. Learn how to attract new talent through internships. We recently sat down with Payson Hall ahead of his upcoming 2012 Better Software Conference East presentation titled "Twelve Risks to Enterprise Software Projects - And What to Do about Them" in order to learn more about his experise in the field of risk management.